The LPC2478 Developer's Kit lets you get up-and-running quickly with the LPC2478 OEM Board. All relevant interfaces are available for evaluation or prototyping. 3.2 inch QVGA TFT color LCD with touch screen panel. 200 pos SODIMM connector for OEM Board. Expansion connector with all LCD controller signals, for custom displays. Expansion connector with all cpu signals. USB OTG interface & connector. USB host interface & connector. Full modem RS232 on UART #1 (cannot be used on 32-bit databus cpu boards, but RxD2/TxD2 can alternatively be connected to the RS232 interface). Dual CAN interface & connector. Power supply, either via USB or external 9-15V DC. 0.3F capacitor backup for RTC and LED on ALARM output. Push-button key and LED on P2.10. 4 push-button keys via I2C. USB-to-serial bridge on UART #0, and ISP functionality. 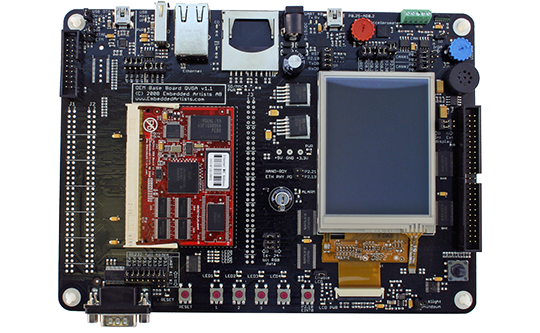 Note: Specifications for the OEM board is available on the LPC2478-32 OEM board page.